This email is to let you know about the consultation on light-vehicle brakes, which will be released for consultation later today. We value your feedback and invite you to make a submission. Please also share this information amongst your networks and via your website, newsletters and information you send out to your members. If you need more information, or have any queries, feel free to get in touch with me to discuss. Join the Pro Rider team for a day of track based training and coaching at either Bruce McLaren Motorsport Park or Hampton Downs Motorsport Park. With Kevin Kinghan and Paul Pavletich as your instructors you’ll have a fun day, along with further developing your skills and knowledge in a relaxed, friendly and safe environment. Please feel free to share this information through your networks and don’t hesitate to contact me if I can help you with anything else. Loose Luggage Spells Danger : It was sad to read of a rider crashing and sustaining serious injuries on their way to the Burt Munro due to a sleeping bag getting trapped in the drivetrain. Loose luggage can be a serious danger, so let’s all remember to attach and tie down securely anything we carry. Bungee straps are useful things but they have two major drawbacks: they stretch, allowing luggage to move around, and ordinary round bungees can ‘roll’ along the surface of what they’re meant to be securing. One antidote to the latter is something we recently discovered when loading up to ride to the Shiny Side Up: Fat Straps. They are bungees but they’re flat rather than round, reducing the tendency for the strap to squirm and move about. You’ll find them at places like The Warehouse and Mitre 10. Just be sure anything you carry on your bike is held down fast and check its secure at every stop. Better still, invest in some fixed luggage-it’s by far the safest option. Saving the planet, one motorcycle at a time : We all know motorcycles have a lot of environmental advantages over bigger vehicles, from lower fuel consumption to defeating congestion. But the bigger role they can play is highlighted in a story we found about Mongolian park rangers and the difference they are now making to wildlife and environmental protection. It’s all thanks to a project called Rally For Rangers. Observing the calamitous unreliability of the rangers’ ancient Russian and Chinese machines, former US National Park Ranger Robert McIntosh determined to do something about it. 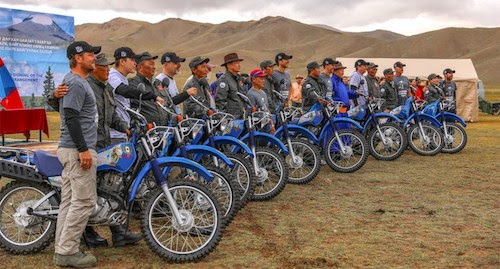 Robert and fellow ex-US Ranger Wes Thornberry ended up delivering 15 trail bikes to Mongolia, and their work continues. Click on the pic for the link to their web page. 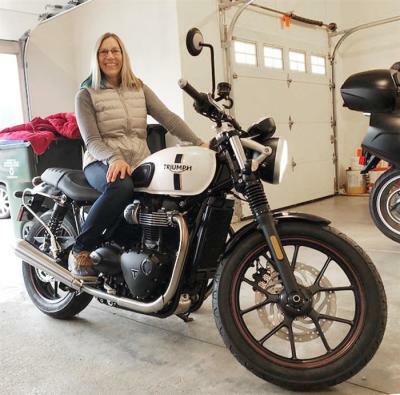 Filling the Empty Nest with Motorcycles -Sparking a new passion, this motorcyclist is hooked! :I’m 56 years old and just started riding a motorcycle last July. I had been a passenger on several different bikes while growing up. In fact, I only started dating my husband 22 years ago because he rode a motorcycle. When my husband and I married and had our son, we quit riding for 21 years. But the minute our son left for college, I suggested to my husband that it was time to get back on a motorcycle. So, we bought a BMW F800 GT that he still rides today. While I love my little Miata, it just didn’t quite satisfy my wanderlust. With our only child off to college, the empty nest and thoughts about getting old got me thinking that I really needed something new, exciting, and challenging in my life. a great idea and supported me completely. stayed for the end of the class to watch my classmates take their test, then I departed. I spent the rest of the summer riding with my husband. We also spent time practicing the exercises I learned in my class. My husband has been a rider since he was young, so he enjoyed practicing the exercises on his bike along with me. My permit is good for a year, so I felt that I could wait until next spring/summer to get my license, but not having my license was like a black cloud over my head. I wanted it, and I wanted it now! So I scheduled my license test at the DMV for mid-October. I was so nervous I barely slept for the two weeks leading up to my scheduled test. I had a wonderful lady instructor and she helped me to relax. I did great and passed! I was so excited! The little Honda Rebel was an awesome learner bike for me and I feel 100% that it was the right decision to start on. I’m 5 feet 3 inches and weigh 125 pounds. I wanted a bike that I could easily flat foot, and maneuver around the garage. The Rebel provided that for me, and was easy enough to ride that I gained confidence quickly. When I bought my Rebel from a woman who had also used it as her first bike, I was thinking that she moved up to another bike rather quickly. After one summer with the Rebel, I was also ready to get something bigger. 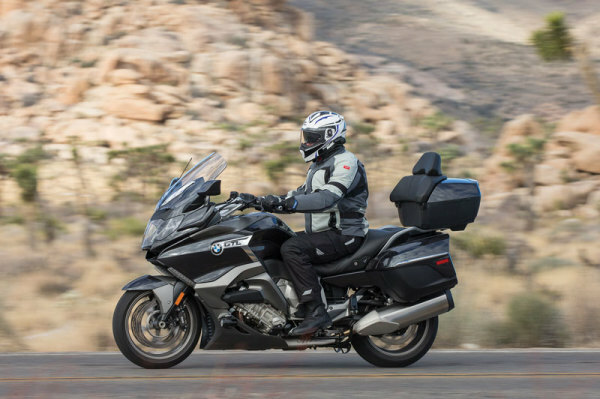 With our future riding plans and travel in mind, I started researching my next bike. I selected a Triumph Street Twin. It is a 900cc bike, and I was a little afraid that it would be too much for me. Sadly, I live in Ohio, so my beautiful bike is now all “settled in for a long winters nap”. Spring/Summer cannot come quick enough for me! As other women have stated this in their stories, I too wish I had learned sooner! My husband and I are talking about getting a trailer so that in the near future we can plan trips and take our bikes with us to explore and ride. I was devastated when my son left for college, wondering what I would do with myself. Well, now I know! Riding during autumn always has me in a quandary for gloves. Too heavy—you sweat. Too thin—you freeze. 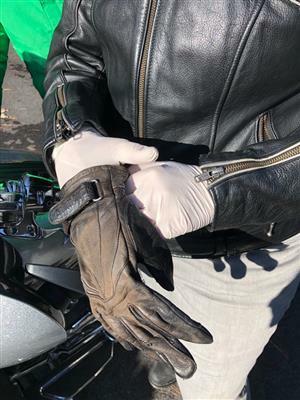 The temperature starts warmer then drops during the day, so you go from “comfortable” to “I can’t feel my fingers.” My simple solution is a pair of latex gloves. They provide a quick layer of warmth, wind protection, and they keep wet weather away from your hands. I never leave home without them on the bike and take them with me on every trip. I’ve even been known to hand out a pair or two! Gear is a must for cold-weather riding. On a budget? Layers and leathers. From undergarments to leathers and shells, this allows you to stay comfortable while being versatile enough to shed layers when things warm up. If affordable, some of the latest technology like seat, leg, and handgrip warmers or plug-in heat liners or shells are available. Hydration is also a necessity when riding in colder weather. You may not feel very thirsty, but dehydration can lead to fatigue or dizziness (alcohol and caffeine can make this worse). It is recommended to consume at least half your body weight in ounces of water. Metabolism also decreases during colder temperatures. The best way to stimulate your metabolism is to eat small balanced meals throughout the day. Your furnace will continue burning while keeping your mind and body awake and a bit warmer. Need a pit-stop? Whether you’re feeling a bit tired or just too darn cold to continue riding, pull over, gather your faculties, and warm up a bit. Run some warm water on your hands or warm them up under a hand dryer. Otherwise take a brisk walk or perform repetitive movements to get the circulation going again. I don’t care for people who do a lot of posturing; but I do have admiration for riders with good posture. After all, riding posture is one of the most overlooked aspects of road riding. For most of us, the topic was last mentioned in a beginning rider course (you took one of those, right?). Yet, proper riding posture can do wonders to improve control and provide all-day comfort. Even on a straight road, it’s important to place ourselves in a central position that allows the bike to move freely beneath us as we stay mostly still. For that to happen, we must sit upright and relaxed. The back should be straight, but not stiff (and never slouched). Arms should be loose and elbows relaxed, never locked. Hands rest lightly on the bars—not gripping them—to improve feel through the bars and enable lighter steering input. Knees are bent slightly and lightly press against the tank. Having your feet on the footpegs ready to bear your weight creates a more athletic position (I place the balls of my feet on the pegs when not shifting or braking). Riders often complain of aching shoulders, sore wrists and stiff backs after even a few miles of riding. The culprit is often poor posture. Improve comfort by rolling your hips forward, which straightens the spine and absorbs shocks more efficiently. Rotate shoulders back instead of allowing them to roll forward; this one adjustment will greatly reduce shoulder stress and arm fatigue. Hinge forward at the waist to reach the handlebars without straightening your arms. Be sure not to place weight on your hands and wrists. It may feel awkward at first, but will soon become second nature. So, straighten up and ride right…and see what a little posturing work can do to give you more control and less pain.